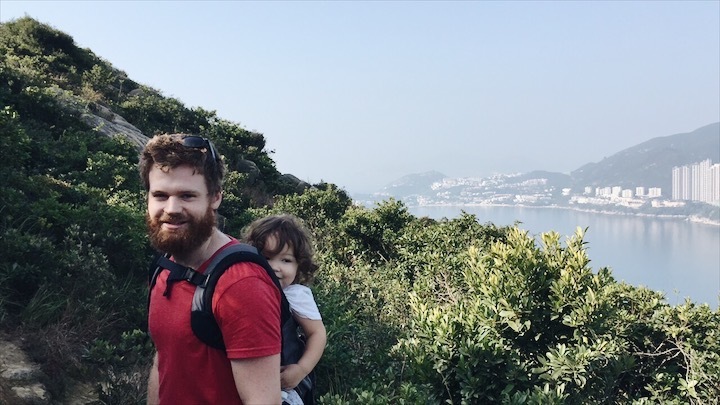 On our fourth trip to Hong Kong, Steve had a little time off work and we decided to explore one of Hong Kong's finest hiking trails, Dragon's Back. We weren't quite prepared for what was in store for us (neither of us had hiking clothes or shoes), I did some rough research the night before and we decided we'd just give it a bash. We set out bright and early and took the MTR to Shau Kei Wan station, then a bus to get to the start of the trail. Four hours later, we finally made it to Big Wave Bay. That's right, I'm not kidding, FOUR HOURS. Truth be told, that's not a bad speed when you're an amateur hiker with a kid on your back or just walking at the pace of an almost 3 year old. And to give Oscar due credit, he barely complained the whole way and did a fair amount of the hike on his own (River slept for most of the hike in the wrap). We were so proud of him and how strong his little legs were! 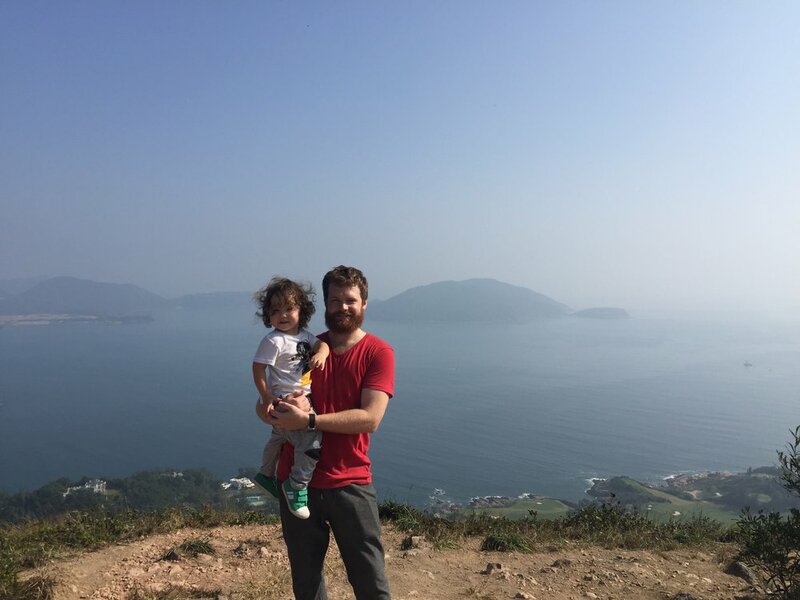 This being our first hike in Hong Kong, we were honestly taken aback by how beautiful it was and what a juxtaposition these rolling hills and stunning coastlines were to the hustle and bustle of the city. It was such a breath of fresh air! The hike was filled with amazing views and vistas. The stairs up were a bit of a workout for us with the kids and the walk itself along the length of dragon's back got pretty hot pretty fast. There isn't very much shade so definitely come prepared with sunscreen and hats for the littles. Also, bring water and snacks because there is nothing to buy along the way. Once you're down Dragon's Back, you can either choose to get on a bus back to the MTR or hiking down towards Big Wave Bay. Don't be fooled and think it's just a short walk down to the beach, it is another two hours downhill towards the beach. This second part of the hike is much less interesting than the first but the payoff is pretty great when you get to dip your feet in the cool water. There are a few stores on the beach selling food and drink, we got a bite to eat and then just chilled at the beach for the rest of the afternoon. Steve went in for a dip, Oscar played in the sand and River napped - it was a great way to relax after a crazy morning. If you're headed to Hong Kong, I'd definitely recommend going for a hike on Dragon's Back, the views alone are worth it!